The city’s been hit with another class action lawsuit over its interactions with homeless San Diegans. The lawyers behind the suit say they hope to force policy solutions they believe the city has dragged its feet on. A class action filed this weekend urges the city to stop issuing violations against homeless residents using a city code intended to target trash dumpsters. It represents the latest legal move to force the city to overhaul its dealings with its homeless population. Attorneys Kath Rogers and Scott Dreher filed suit in U.S. District Court on behalf of homeless San Diegans who’ve been affected by the policy arguing the city should stop using its encroachment code to police homeless people. They allege the city’s current tack violates homeless San Diegans’ civil and constitutional rights. Dreher, who’s previously negotiated legal settlements that reshaped city homelessness policies, is hoping the lawsuit forces a new round of negotiations rather than a court battle. “We would love to work on something that’s a win-win,” Dreher said. A spokesman for the city attorney’s office said Monday that city lawyers will review the case and consult with city officials. He said the city is open to discussions with the attorneys. Dreher and Rogers’ lawsuit argues the city’s use of its encroachment code, which was meant to force the removal of waste or trash bins from sidewalks, to force homeless folks to move elsewhere amounts to cruel and unusual punishment and violates due process and equal protection rights, among other violations. They claim the city’s encroachment code is vague and that the city is using it to unfairly punish homeless people who lack a place to store their belongings. The result, the attorneys argue, is that homeless people can end up in jail or with stay-away orders that bar them from large areas, including those where homeless-serving nonprofits are concentrated, while homeowners who violate the code get courtesy notices. Police have said they offer services and warn homeless people before citing or arresting them, and that they tend to use the city’s encroachment code because it can be pursued as a lower-level offense with lesser fines and punishment. They also say they’re trying to balance increasing community complaints about homeless people blocking sidewalks or settling in front of condos and businesses with homeless San Diegans’ rights and needs. Dreher wants to talk to city officials about the potential for safe zones where homeless folks could go without fear of arrests or citations. Dreher said he sees the lawsuit as a tool to force a conversation he said city officials have largely avoided. “The city attorney has been willing to sit down and talk but the rest of the city, all they do is talk about talking about it,” Dreher said. The new lawsuit comes amid rampant concerns about both rising street homelessness and police interactions with those living on the streets. 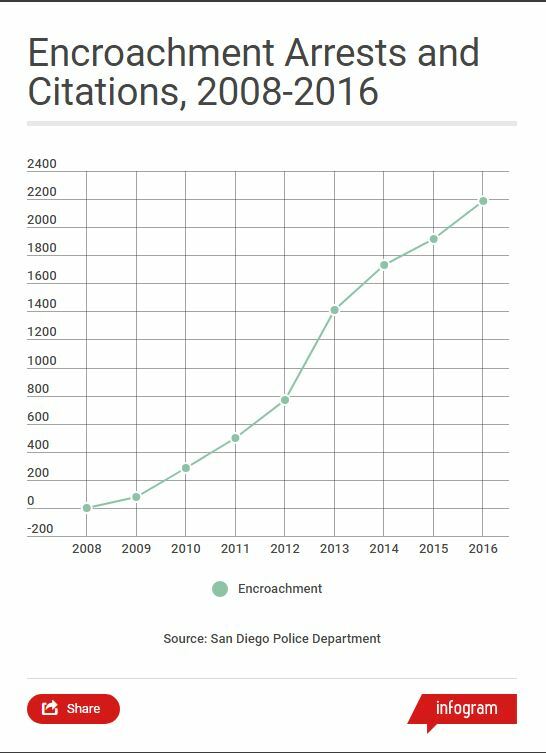 Encroachment citations and arrests have spiked dramatically following a settlement Dreher helped ink in 2007 that aimed to discourage the criminalization of homelessness. The 2007 deal is one of two agreements Dreher negotiated with the city over the last decade. The 2007 settlement followed a class action filed by Dreher and attorney Tim Cohelan over the city’s enforcement of illegal lodging. Illegal lodging requires police to prove that a person has settled somewhere without permission. The deal Dreher helped negotiate mandates that police offer a shelter bed to a homeless person they encounter on the streets downtown between 9 p.m. and 5:30 a.m. before they can cite or arrest someone. Dreher argues the city’s increased use of its encroachment code is an attempt to get around that settlement. Police say that’s not the case. Dreher teamed with the San Diego ACLU on another lawsuit that accused the city and the Downtown San Diego Partnership of unlawfully seizing and discarding homeless people’s property. That case led to a 2011 settlement requiring the city to provide at least three days’ notice before sweeps of homeless encampments and to set up a city-funded storage facility where unattended property can be held after clean-ups. Now Dreher, Rogers and 10 plaintiffs are hoping the latest lawsuit will again force changes. One of those plaintiffs is Sheri Pasanen, the former director of Catholic Charities’ day center and night shelter for homeless women. She ended up homeless herself a few years ago and is now eager to push the city to change its approach. “I just want them to assist the homeless instead of putting barriers in front of them,” Pasanen said. Pasanen said an encroachment citation she received in November 2014 did more to frustrate and overwhelm her than get her off the street. She recalled receiving that ticket for setting a small stove she used to make coffee on a sidewalk near Chicano Park. An officer flagged her down as he drove by, spotting her tent just steps away. Pasanen said police helped her get into the now-shuttered Alpha Project winter tent for a time. When it came time to resolve her citation, she took multiple buses to traffic court in Kearny Mesa. There, she learned she’d need to return to court if she wanted to challenge the citation. Pasanen said a bout with pneumonia kept her from making it to her next court appearance. By the time she had recovered six months later, Pasanen said she’d given up dealing with the ticket. It’s a response homeless folks and those who advocate for them say is common given the grind of life on the streets. “I couldn’t afford to pay it so I just kind of put it away,” Pasanen said. At most, she might have faced a $280 fine. But Pasanen’s unpaid ticket didn’t disappear. Pasanen, who’s since moved into an apartment, later learned she had a warrant. A collection agency got involved. When Pasanen later tried to get off the street, she said one landlord told her not to bother filling out a rental application when she described the situation. Plaintiffs in the lawsuit who remain homeless describe other roadblocks. Debra Smith, who ended up on downtown streets last March, said she hasn’t gone to court to address the four citations she’s received since then. She’s a plaintiff too. “My backpack got stolen one month. That had two tickets in it. Then my purse got stolen the next month and it had the other two tickets in it,” Smith said. In the process, Smith lost the prescriptions she has for chronic pain and other ailments as well as the information she needed to go to court. Plaintiff Robert Kelsey, who’s received several encroachment citations since 2013, said he was forced to go without crucial anti-viral medication he takes for HIV during the three days he spent in jail after a March arrest. In some cases, encroachment citations can also lead to agreements with authorities that result in stay-away orders barring homeless people from areas where the agencies trying to help them are concentrated. Alexis Leftridge, 22, moved into a room at Father Joe’s Villages with her three-month-old son earlier this year after spending nearly three years on downtown streets. Yet she still worries that the stay-away order she received after repeated citations and arrests could lead to more jail time if an officer spots her around the nonprofit’s East Village campus. After all, her stay-away order covers that area. Now she’s a plaintiff in Dreher and Rogers’ lawsuit. She said she is hopeful the suit will give city leaders a window into the challenges of life on the street and inspire policy changes. “It’s not right for them to just arrest us instead of helping us,” Leftridge said.